What Is the Earth's Atmosphere Composition & Temperature? How Do CFCs Damage the Ozone Layer? In Which Layers of the Earth's Atmosphere Does the Temperature Decrease? Five layers of atmosphere cloak the Earth. The lower atmospheric layer, in which people live and breathe, is the troposphere. Two layers that make up the middle atmosphere -- the stratosphere, where jets fly, and the mesosphere -- cover the troposphere. 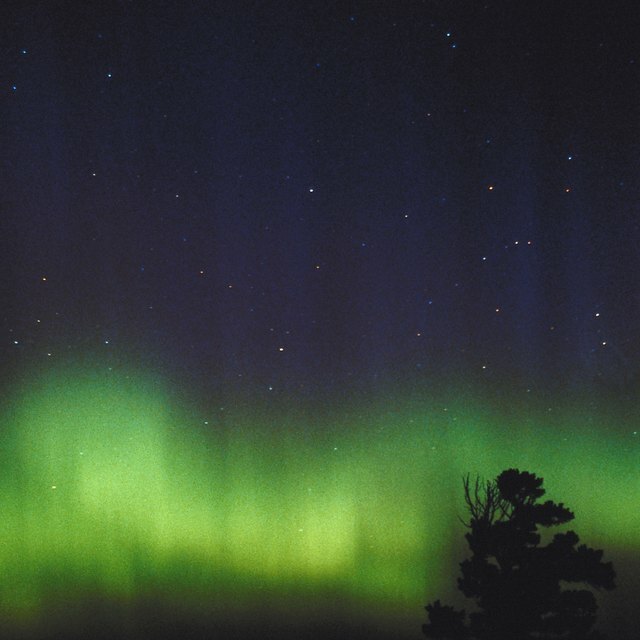 The upper atmosphere contains both the thermosphere, where the aurora borealis lights up the sky, and the exosphere, where the atmosphere meets space. The ozone layer lies within the stratosphere. Carbon dioxide concentrations are increasing in all layers but the exosphere. Carbon dioxide prevents the formation of new ozone molecules in the troposphere, and higher CO2 levels in the upper atmosphere may be contributing overall to the closing of the ozone holes over the poles. Normally, molecular oxygen consists of two atoms of oxygen. In the stratosphere, however, the sun's radiation breaks some of the molecular oxygen apart. When a single atom of oxygen bumps into molecular oxygen, the three atoms fuse together to form ozone. There isn't a lot of ozone in the stratosphere, but what is there performs a very important task for living creatures on the surface of the planet. The ozone is just the right size to bounce much of the sun's ultraviolet radiation back out into space and prevent it from reaching the Earth's surface. High levels of UV radiation cause skin cancer and blindness. In the mid-1980s, scientists discovered that a seasonal hole was forming in the ozone layer over the South Pole. Something was destroying the ozone in the upper atmosphere. Experiments identified fluorine, bromine and chlorine in the form of chlorofluorocarbons, methyl bromide and hydrochlorofluorocarbons as the culprits. These chemicals were used in refrigerators, hairsprays and fire extinguishers. Politicians and scientists combined forces to find substitutes for these harmful chemicals and outlaw the HFCs and CFCs that were causing the ozone depletion. Now, the ozone layer is rapidly recovering. Carbon dioxide has no direct effect on ozone, unlike CFCs and HFCs. Higher levels of carbon dioxide, however, do have an indirect effect on the ozone layer in the stratosphere. What effect it has varies with which atmospheric layer it's in and on the latitude. In the lower stratosphere -- closest to the surface and close to the equator -- increased CO2 is slowing the production of new ozone, especially in the spring. But near the poles and in the upper stratosphere, CO2 is increasing the amount of ozone by preventing nitrogen oxide from breaking it down. According to a study published in the March 2002 Journal of Geographical Research by a joint research team from the University of Maryland and NASA, overall, the increased amount of CO2 in the atmosphere is speeding up the recovery of the ozone layer -- including the hole at the South Pole. Ozone is one of the top greenhouse gases helping to hold in the heat from the sun's radiation. Like the other greenhouse gases, ozone blocks heat from the Earth's surface and prevents it from escaping into outer space. This insulating effect is important because otherwise the surface of the earth would quickly cool down to very cold temperatures at night. Eventually, the planet would become inhospitable to most life forms. Too many greenhouse gases, though, cause too much heat to be held in at night, which causes a slow increase in the average global temperature. Despite ozone's participation as a greenhouse gas, it's still important that it return to its normal levels. If ozone doesn't return to normal levels, the risk of developing skin cancer and cataracts increases from the increased levels of UV radiation that will reach the Earth. Union of Concerned Scientists: Is There a Connection Between the Ozone Hole and Global Warming? Writing fanzine-based articles since 1985, Kasandra Rose writes and edits articles for political and health blogs and TrueBloodNet.com and has an extensive technical writing background. She holds a Bachelor of Science in biology and a Bachelor of Arts in anthropology from the University of Michigan, and a Master of Arts in biology from Wayne State University. What Happens to the Temperature as Altitude Increases? What Is the Chemical Formula of Ozone and How Is Ozone Formed in the Atmosphere? Rose, Kasandra. "Does CO2 Deplete the Ozone Layer?" Sciencing, https://sciencing.com/co2-deplete-ozone-layer-4828.html. 13 April 2018.